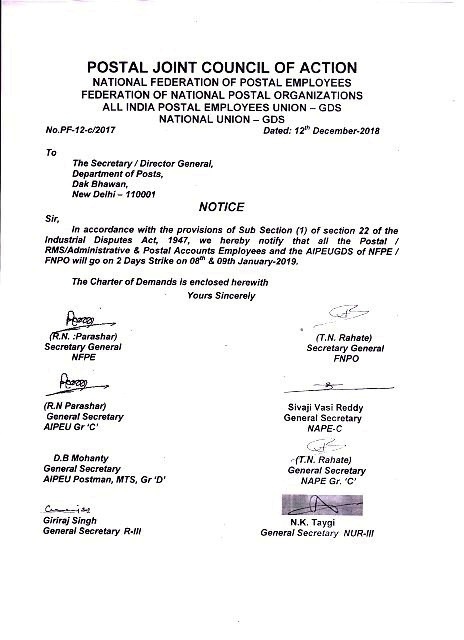 In accordance with the provisions of Sub Section (1) of section 22 of the Industrial Disputes Act, 1947, we hereby notify that all the Postal / RMS / Administrative 8 Postal Accounts Employees and The AIPEUGDS of NFPE / FNPO will go on 2 Days Strike on 08 & 09th January 2019. 11. Consider the suggestions given by RMS JCA regarding PNOP & CSI. 12. Enhancement of higher payscales to those categories whose minimum qualification has been enhanced e.g Postmen, Mail guard. 14. Withdraw orders of enhancement of cash conyance limit without security. 15. Implement all High Court and Supreme Court decisions in C/W MACP, RTP and others. 17. Retention of Civil wing in the Deptt of Post. 18. Holding of Deptt Council Meetings and periodical meetings at all levels. 19. Stop Trade Union victimization and in the name of unscientific targets. 20. 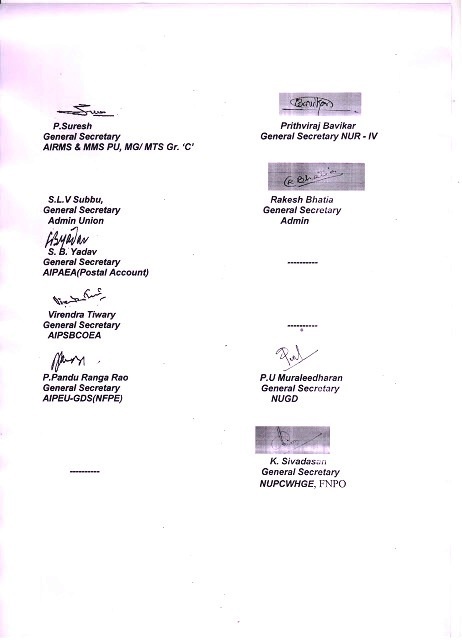 Provide 40 percent SCF quota promotion in AAO cadre and amend RR incorporating the modifications demanded by AIPAEA.